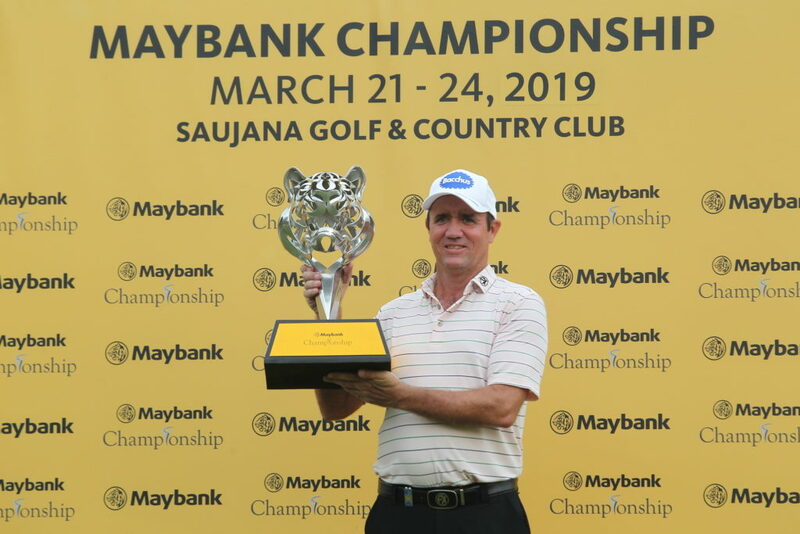 KUALA LUMPUR – 24 March 2019 – Australian Scott Hend prevailed in a dramatic finale to the US$3 million Maybank Championship at Saujana Golf & Country Club in Subang Jaya, Selangor, today when he came through with a playoff victory over Spain’s Nacho Elvira. The top-two were level-pegged after regulation on 15-under-par 273 and that after the Spaniard, who led the Thailand-based Hend by three at the start of the last day, holed a long and daunting putt for birdie. But the 46-year-old was not to be outdone. He secured his third European Tour title with a first-hole playoff win and graciously and deservedly accepted the Tiger Trophy from KDYMM Seri Paduka Baginda Yang di-Pertuan Agong, Al-Sultan Abdullah Ri’ayatuddin Al-Mustafa Billah Shah ibni Sultan Haji Ahmad Shah Al-Musta’in Billah. With both players on the 72nd green, tournament play was suspended for an hour and 41 minutes because of a heavy downpour. After that Elvira, who led David Lipsky two shots and Hend by three after the third round, drained that long putt to set-up the playoff. Digging deep into his reserves of experience, Hend held his nerve when it mattered most, and sank a birdie of his own at the first playoff hole to collect the US$500,000 winner’s cheque. “Today, you have lifted the game one notch higher and truly inspired us all. We have seen how it is not just skills, but also discipline, focus and determination that make a winner. Well done!” said Datuk Abdul Farid. Scott Hend’s brilliant fourth round left overnight leader Nacho Elvira to settle for second placing, while Jazz Janewattananond, Johannes Veerman and Oliver Fisher finished third, fourth, and fifth respectively. Hend’s victory will forever be remembered as one of the best rounds of golf in Malaysia. He struggled a bit on the opening two days, but a third round 67 pulled him to within one stroke of the lead and set up today’s round for his biggest win yet on Saujana’s Palm “Cobra” course. His win should move him as high as sixth place on the 2019 Race to Dubai Rankings presented by Rolex, with 873.4 points, up from 39th. He should also climb to 133rd position in the Official World Golf Ranking, up from 253rd. All of Hend’s European Tour wins have come in Asia. His previous titles are the 2014 Hong Kong Open and 2016 True Thailand Classic presented by Chang. The top Malaysian in the field was Nicholas Fung, finishing tied for 15th on eight-under 280, while countryman Gavin Green finished joint 30th on five-under 283.